The 7920 flowmeters provide the most accurate indication and precise control of fluids available for a wide range of applications. This versatile meter is functionally and dimensionally interchangeable with other current designs while incorporating many innovative features. 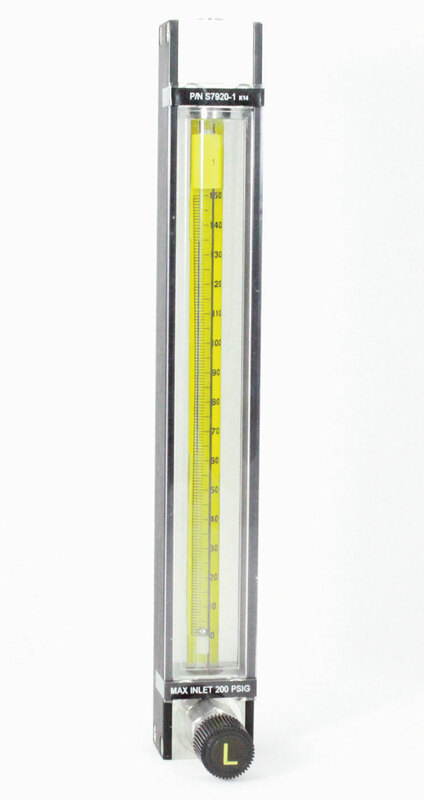 All 7920 glass metering tubes have integral float guides to assure the accuracy of ±5% of full scale. Glass and stainless steel floats are standard. The meters are available in a wide range of flows. Front window incorporates a 1.5 X scale magnification factor for more accurate tube reading. End seals in the design are direct-acting and nonrotating for fast alignment and convenient service access. High resolution 150mm scale length. Many standard direct reading scales available. Precision taper, fluted metering tube. Lowest available pressure drop via maximum flow path area increases available flow rates at low feed pressures. Standard front panel mounting requires minimum hardware - easy installation, quick access. Available utility and high precision metering valves do not require special fittings. Simplified; direct acting non-rotating compression seal. 1/4” NPT female connections are standard.